Does this powerful set of speakers represent good value for money? 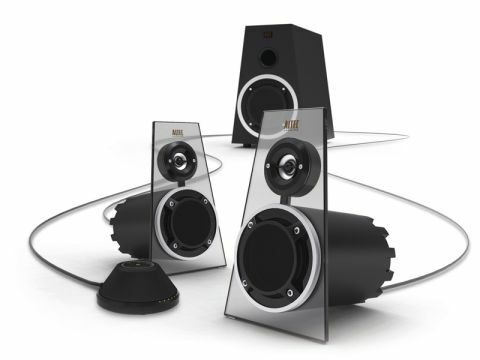 Altec Lansing's MX6021 Expressionist ULTRA 2.1 speaker set is an excellent mix of form and function. For deep bass, a long-throw 6.5-inch subwoofer is built into an imposing, industrial-inspired wooden trapezoidal design. The satellite speakers look good too, with 3-inch midrange woofers and 1-inch neodymium tweeters housed behind smoky-grey Perspex fascias. It's great to see a product that celebrates its technological heritage rather than hiding it away or disguising it as something else. The system is supplied with a handy wired controller unit, from which you can it switch on or off and control the volume, treble and bass. It also houses 3.5-inch jack ports so you can connect a pair of headphones for private listening, and auxiliary audio units such as MP3 players, CD players or games consoles.It's much more convenient than ferreting around behind the subwoofer unit. Although designed with the computer user in mind, it could be just as at home around your TV or as part of your sound system. The Expressionist ULTRA is clearly built for power, and it delivers. The bass distorts a little at very high volumes, but it fills a decent-sized room long before distortion sets in. Sound quality is high, with crystal clarity and balance. There's some hissing when it's on but inactive, though it's nothing too problematic. More worrying is its price. £250 is too expensive, even for this decent set.